A carotid endarterectomy is a serious medical procedure designed to reduce the risk of a stroke for patients with atherosclerotic debris (plaque) that can block the flow of blood. It is a routinely performed yet significant procedure that usually requires a hospital stay. Arterial plaque of concern is often found from carotid Doppler studies and/or an echocardiogram. The purpose of an endarterectomy is to remove the plaque that can block the flow of blood. The procedure is seemingly simple. The doctor goes in through the neck and exposes the artery of concern and then opens the artery and removes the plaque. The surgeon may have to insert a tube to redirect the blood around the artery being repaired. Again, this is serious surgery and it comes with risks. Even with the best surgeon in the world, this is not a risk free procedure. But medical care can help to reduce those risks. One reoccurring malpractice case involving this procedure is damaging critical nerves in the neck. In particular, surgeons performing an endarterectomy should identify the hypoglossal nerve and retract it to prevent cutting the nerve. If this is not properly done, the patient may have tongue deviation or dysphagia (an awful condition that may make swallowing difficult or painful). You would think that failing to identify and protect the hypoglossal nerve would lead the doctor to concede medical malpractice. Yet these cases are routinely defended, even those that appear to be slam dunk malpractice lawsuits for cutting the hypoglossal nerve and causing injury to the patient. Doctors’ medical malpractice lawyers’ typically argue that injury to the hypoglossal and other nerves are a known risk to an endarterectomy. It is true. There are risks to almost anything. It is a known risk that you might get hit by a drunk at a bar. But that does not absolve the drunk of responsibility. Another common defense is the “patient had unusual anatomy.” This is a common defense in surgery cases and it can be effective: how do you argue your internal anatomy is perfectly normal? These are slightly more saleable defenses in some cases but usually it is a reflex response for surgeons being questioned even if, there is nothing to indicate the patient had an unusual anatomy (and no one else in the operating room remembers any suggestion that there was a problem with the patient’s anatomy). Moreover, there is a good rule: don’t cut unless you know what you are cutting. 2011: New York - Settlement of $250,000. Plaintiff was a surgical patient at the VA for bilateral carotid stenosis. During the surgery, his hypoglossal nerve was damaged. His lawsuit was against the VA (which is really the U.S. government). The man later died of heart failure that was allegedly related to his injuries during surgery. 2009 Washington - Verdict of $2,954,000. A 63 year-old surgical nurse had a partially blocked carotid artery. During a carotid endarterectomy, the surgeon thought he was cutting a vein and cut a nerve. 2007: Maryland: Defense Verdict. An 80 year old woman, underwent a carotid endarterectomy because she had an occlusion of the internal carotid artery. During surgery, the patient had unexpected bleeding from the distal internal carotid artery. Things went downhill from there. Attempts to repair the carotid artery failed and the artery was ligated. Plaintiff suffered a neuropraxis cranial nerve injury and alleged stroke from the doctor's failure to try to repair the artery. It is a tough argument and a Baltimore City jury quickly came back with a defense verdict. 2004: Rhode Island - Verdict of $200,000. A 63 year old-plaintiff had carotid endarterectomy surgery after a minor stroke, hoping to remove plaque from her carotid artery. Her surgeon accidentally cut her hypoglossal nerve. The doctor defense - the usual "abnormal anatomy" defense - failed but the jury obviously questioned the extent and scope of Plaintiff's injuries. 2002 California - Verdict of $1.2 Million. A 39-year-old man who was a personal trainer was diagnosed with hypercalcemia caused by an elevated parathyroid hormone. During surgery to fix the condition, the doctor cut the hypoglossal nerve causing a paralyzed vocal cord and constant nausea and vomiting. Plaintiff's lawsuit successfully contended that the doctors negligently failed to identify and steer clear of the vagus nerve. 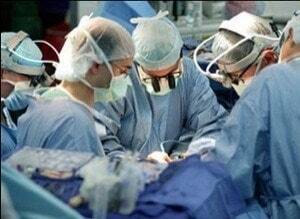 Our malpractice lawyers handle cases where the hypoglossal nerve has been cut during surgery. If you or a loved one sustained a serious injury as a result of an error or mistake during surgery, call our malpractice attorneys at 800-553-8082 or get a free online consultation.